Winter 4x4 Event | Get up to $3500 rebates on 2017 Jeep Wrangler models at Abbotsford Chrysler! 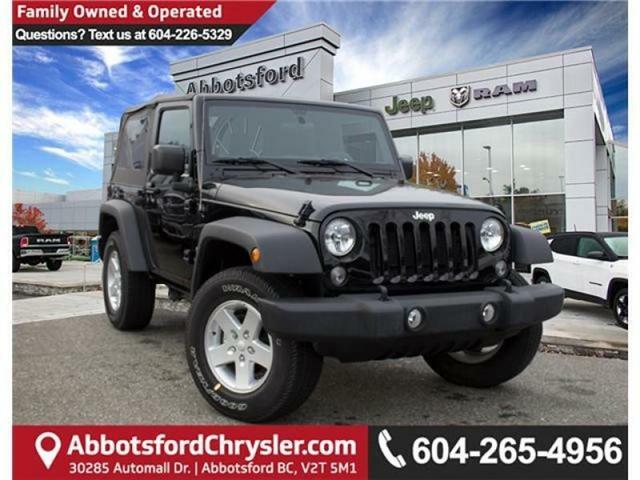 Abbotsford Chrysler | Winter 4×4 Event: Rebates on ALL 2017 Jeep Wranglers! Wranglers are FINALLY ON SALE with the 4X4 Winter Event! This is a big deal! If you love Jeep Wranglers, you know that they never get rebates! Wranglers hold their resale value better than any other vehicle in North America and for good reason. Right now, for the first time in as long as we can remember, 2017 Jeep Wranglers you can get a generous $3,500 of MSRP in rebates! That’s right! $3,500 in rebates on 2017 Jeep Wranglers! We will give you a second to absorb that news. It’s pretty amazing right? It’s been a LONG wait but the time is now to take advantage of this historic offer and get into the ultimate ready for anything vehicle. Snow? Easy! Mud? Not a problem! Rough Mountain Trails? Pfft! If you want to get into a 2017 Jeep Wrangler then don’t wait. Call, Email or visit us today! Seriously…. They won’t last long! Don’t forget to ask us about taking a New Year’s Payment Vacation and don’t make a payment for up to 6 months or find out how you can get up to $20,000 in Cash Back. See our full selection of 2017 Jeep Wrangler Inventory!